Crissy Arseneau comes from a graphic design background and her work reflects her trained eye for design and keen sense of form. Her paper collage is a natural evolution of these sensibilities. Her particular style is a culmination of observation and play. This series above is called ‘Cloud City’. It speaks of the changing clouds that reflect in Vancouver’s many glass high rise windows as they change and pass by. The vertical and horizontal strips of gridded colours are little teaser palettes of weather and colours to come, sunrises, sunsets, high noon. They balance a typical Vancouver grey sky. She takes the time to look up to watch and wonder at those beautiful moving ever-changing clouds, something we all could benefit from doing. A finished piece and a composition in progress, both with gradient colours inspired by a visit to Terra Nova in Richmond. Crissy uses a heavy 140lb weight water colour paper to create these small intimate scenarios. She paints with water colours, cuts, layers, places, takes away and moves these forms as she plays with the forms and shadows. The operative word being Play. They are little art puzzles. What works best here? Maybe this cloud wants to go there. Every shuffle changes the scene. What fun! All the while taking in and expressing the blending of nature and man-made creations. She celebrates this. Embossing to create dimension and texture. I was commenting on how clean and crisp her designs are when she shows me this. Her glorious chaos. Beauty is born from disarray. How inspiring! This tiny treasure 3” image in a frame draws me in, it is otherworldly in a subtle way. 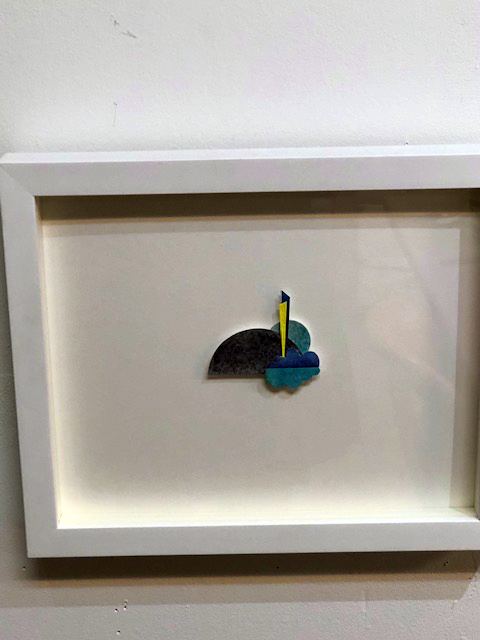 This one is part of the 'Planetary Play' series and is called, 'Interpretations of Astronomical Observations' because it reminded her of an observatory! 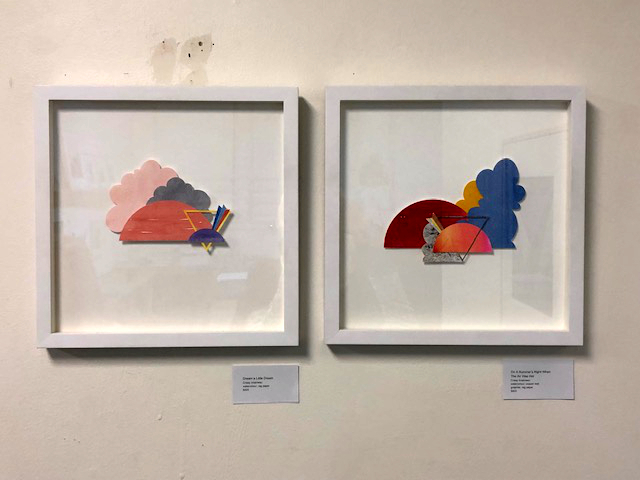 Earth, sunset, shards of light shining through a prism, refracting on clouds all condense into the this miniature scene that reminds Crissy of her childhood home. There is lots to muse on. Prisms and triangles Earth and Sky - little treasures. 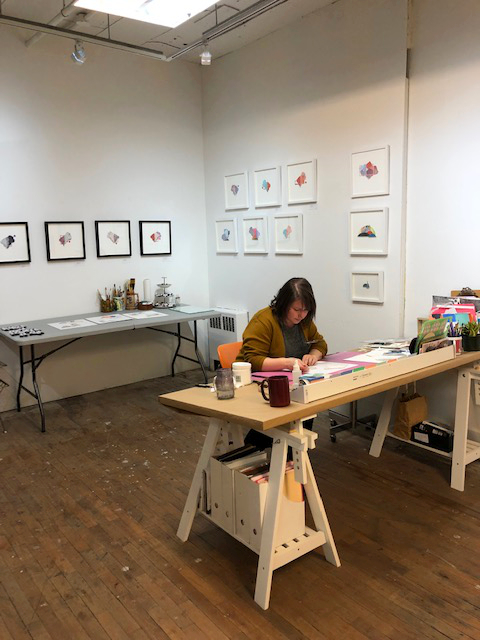 Crissy shares a fabulous studio with 5 other artists who seem to share a similar sensibility but express it very differently. It’s an industrious and productive environment to thrive in.